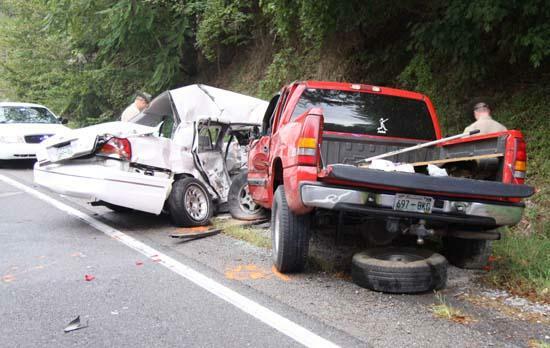 One person was killed this morning in a two-vehicle accident on McMinnville Hwy. (Hwy. 70S) just before the top of the hill. The accident occurred around 7:40 a.m., and involved a white 1998 Crown Victoria and a red 2001 Chevy Silverado pickup truck. The female driver of the Crown Victoria, Teresa Marie Satchell, died as a result of the accident. Satchell, 46, was a resident of Powell Street in Woodbury. The driver of the pickup, Edward H. Hoskins, Jr., 46, was injuried in the crash. He is a resident of Valley Drive in Woodbury. Both drivers were using safety belts. Simmons said the Crown Victoria was traveling east on McMinnville Hwy. and the Ford truck west when the driver of the Crown Victoria lost control, overcorrected and crossed into the west bound lane. The Hoskins vehicle struck the Satchell vehicle in the right passenger door. Simmons said that slick roads were likely a contributing cause of the accident. He does not anticipate any charges being filed against Hoskins. The THP along with the Cannon County Sheriff's Department, Woodbury Police Department, Woodbury Fire Department, Cannon County Rescue Squad and Cannon County Ambulance Service responded to the accident. We did not post the name until we had confirmation from a law enforcement official that the family had been notified. Something needs to be done with that location of highway. This woman/family/daughter/mother/wife lost her life at this dangerous area of the highway. I almost lost my father at that location two years ago!! Please have the road commission review this area! Thank you. This is terrible. I knew Teresa and she was my family doctors assistant.she will b missed.